For many of us, when the beat takes hold it’s hard to resist busting a move. However, dancing isn’t something that comes naturally to everyone, and as such guests can be quite shy about taking to the floor to dance at your event. With only 0.6 percent of Australians participating in regular recreational dancing according to a paper on the topic by the Australian Sports Commission, it’s no surprise that a huge number of people don’t feel confident or comfortable on the dance floor. 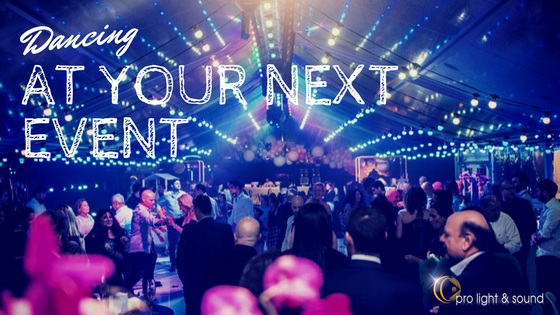 So how can you encourage guests to get up on their feet and move their bodies at your next party, gala or wedding? If your venue doesn’t have a designated dance area, many guests can feel uneasy about getting out of their seats to shake their stuff. Solve this by creating a clear space where partygoers can enjoy your music. Hire staging or a dance floor and set it apart from the rest of your venue with event lighting such as a flashing strobe and fog effects. More subtle uplighting around the perimeter can help to denote it as a separate space to the rest of the venue. Coordinated dancefloor lighting can also help out, with an operator programming different scenes and effects to suit the timing of your event and music. Create a buzz when the dance floor all of a sudden lights up and the music comes as a signal to your guests that the time is right for dancing. Figure out whether a DJ or live band is best for your specific event. Whichever option you choose, it’s best to test your audio system before the big day to ensure your artist can be heard clearly by everyone in attendance. Quality speakers, microphones and mixers are essential for optimum sound. Finally, make sure the style of music you’re playing suits your audience. Have a list of go-to crowd favourites up your sleeve and consider asking guests for requests to ensure you’re playing the kind of music they enjoy. If you’re planning an event and you want your guests to get up and shake their tail feather, talk to a Pro Light & Sound expert to help you get the set up just right to get everyone dancing!